The Glow slot machine was developed by Netent and included in the selection of games at Oranje Casino. 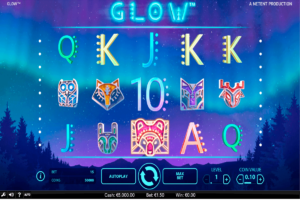 The Glow Touch version can be played in the mobile casino. This can be done free of charge or by transferring money to the player account in order to win money. If use is made of the practice mode, then a fictional amount of playing credit is made available to the player. When playing in practice mode, it is not necessary to log in, so that players without an account can get acquainted with this slot machine in a non-committal way. The symbols are varied with a variety of animal symbols that are combined with symbols that are recognizable by numbers and letters. The symbols are not shown on clearly defined roles, because the roles have the same decor as the background. If roles are nevertheless discussed, then there are five reels and three rows with fifteen paylines available. In an equal combination of three, the symbols have a different value with regard to the payout. For example, the letters and numbers are worth the least and the animal symbols are worth more, but that also varies by color. For example, the red animal symbol is worth the most. Free spins characterize the game of slot machine Glow, because they are very common. All animal symbols can provide free spins if there is a correct combination. Almost all animal symbols offer the same option to win an equal number of free spins, namely 1 free spins with three symbols, two free spins with four equal symbols and five free spins with five equal animal symbols. There is one exception to this, and that is the red animal symbol, because it already gives away a free spin in a combination of two, just as with a combination of three symbols. coin value of 0.01 euros is chosen and the bet level is set to one. A total of ten bet levels are available and the maximum coin value can be set to 1 euro. There are of course all sorts of variations between them, so that the player can determine the desired bet. It can also be varied in between, so that you can play with a lower or higher bet after a turn.